It’s famous for its creamy coconut filling topped with almonds and covered in milk chocolate. It also has a sibling, the Mounds bar, which is basically the same, minus the almonds. And though the recipes for these two candy bars are top secret — just like Coca-Cola or Nutella — it’s possible to recreate these amazing coconutty candies in your own kitchen. 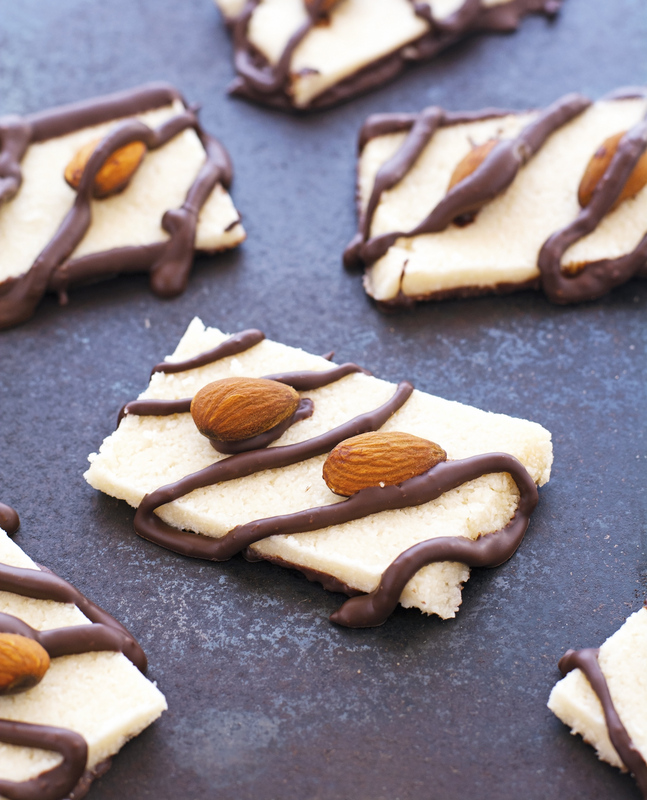 With only a few ingredients you can whip up your own Almond Joy Bars in no time. Needless to say it, these are way healthier than store bought. As in, gluten-free + grain-free + refined sugar-free + vegan healthier + paleo healthier. 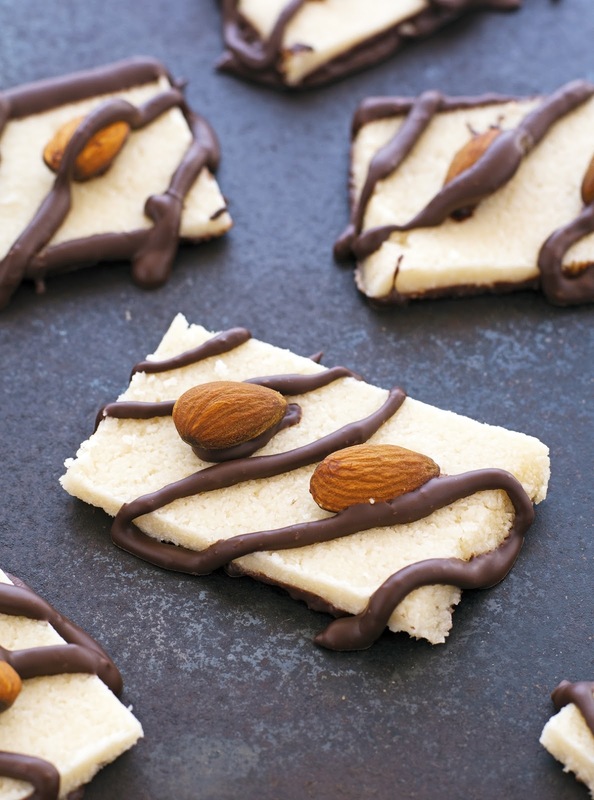 If you love the combination of coconut, almonds, and chocolate, you’ll love snacking on these Homemade Almond Joy Bars. The rich sweetness of the chocolate coating paired with crunchy goodness of the almonds and the flakiness of the coconut makes a delicious — and addicting — treat. Seriously good. But aren’t Almond Joys kind of Grandpa candy bars? No, that’s 3 Musketeers and Baby Ruth, totally an old dude candy bars. Ha! 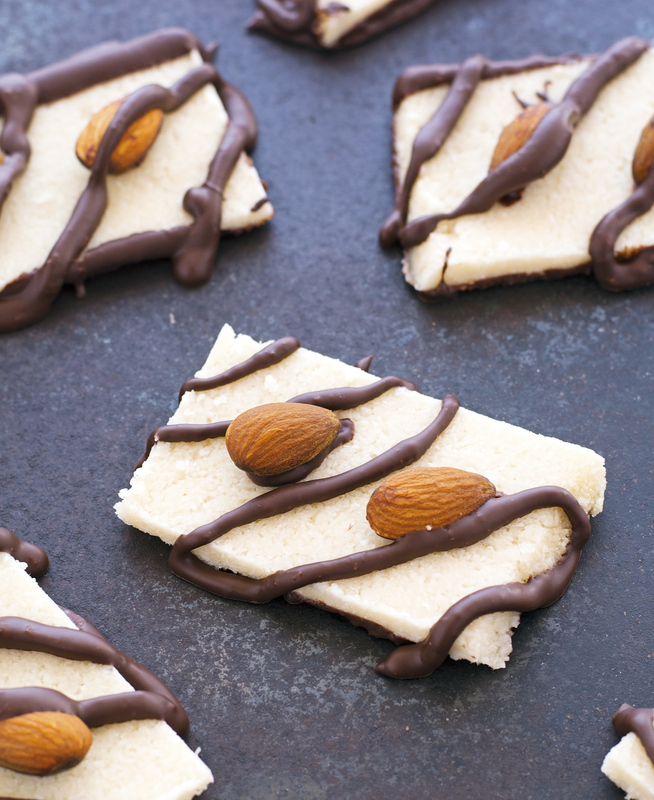 Homemade Almond Joy Bars (Paleo and Vegan) Print this recipe! Line a 4.5 x 8.5-inch loaf pan with parchment paper. Set aside. Place shredded coconut, coconut oil, and maple syrup in the bowl of a food processor (or blender). Pulse until a wet sticky mixture forms. Scoop coconut mixture into the prepared loaf pan and with a spatula press it down and smooth it out until you get a tightly packed even layer. Remove from the freezer, carefully lift the coconut bar out of the loaf pan, and with a sharp knife cut into 16 bars. Line a baking sheet with parchment paper, lay coconut bars on the sheet, and place back in the freezer. To make the chocolate layer, place chocolate chips and coconut oil in medium size heatproof bowl. Place the bowl over a pot of barely simmering water, making sure that the bottom of the bowl doesn’t touch the boiling water. Stir with a wooden spoon until chocolate is completely melted and the mixture is shiny and smooth. Remove coconut bars from the freezer. Dip the bottom of one coconut bar in the melted chocolate, creating a thin coating, and place back onto the baking sheet. Repeat to coat all coconut bars. This step is very messy, I haven’t figured out a way to do it without covering myself in chocolate. Be prepared to lick your fingers and have a major chocolate rush. Take one, dip one side in the melted chocolate, and press into half the surface of one bar (leaving room for another almond). Dip another almond in the melted chocolate and press it in the other half of the bar. Repeat for all bars. With a small spoon drizzle the melted chocolate over the cookies. Alternatively you can scrape the melted chocolate into a Ziploc bag with a small tip cut off and pipe the chocolate. Place back in the freezer for 15 minutes, then transfer to an airtight container and refrigerate for up to 1 week. One bar yields 137 calories, 11 grams of fat, 11 grams of carbs, and 1 gram of protein. Who knew that it's actually super easy to recreate your fave candy bars and make them healthier! These almond joys look glorious! Ooooh yass! Love almond joys, love even more that I can make them at home and know exactly what's going into them. Candy time!! I don't discriminate against candy bars, I love them all - even the grandpa ones! I'd love one of these as a little afternoon treat. How much coconut oil is needed for the chocolate layer?